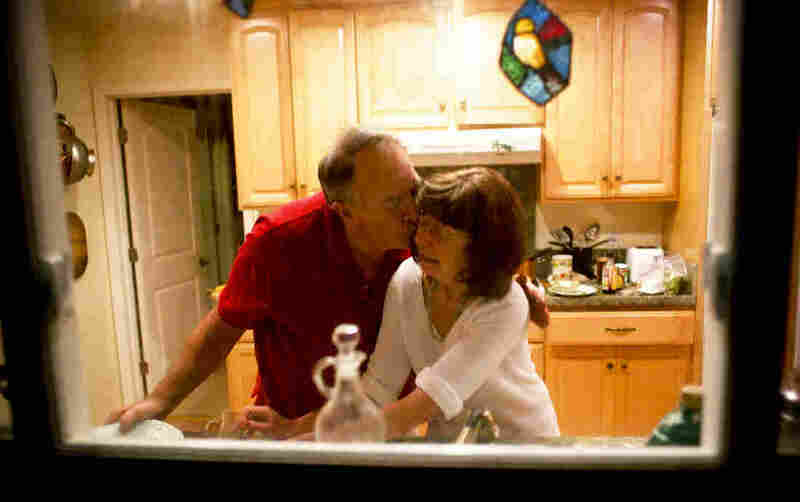 As A Husband Becomes Caregiver To His Wife, A Marriage Evolves : Shots - Health News Rick Rayburn became a full-time caregiver to Marianne, his wife of 42 years, after she developed dementia. She may not be the woman he married, but he says she's helping him become a better husband. Rick Rayburn leads his wife, Marianne, to the kitchen so they can prepare dinner together. She does simple tasks like stirring the soup. But then, about three years ago, she was diagnosed with dementia. It disrupted the couple's lives from top to bottom, right on the cusp of retirement. At 67, Rick has taken on a big new role. "I'm 100 percent responsible for her well-being. I have to help her pick her clothes out, be there when she's getting dressed," he says. "I can't leave her alone too often. I can run out and empty the trash cans or do this or that. And that's always a game you play: How long can I run out and brush my teeth and get shaved without something happening on her side?" Rick is one of 15 million Americans caring for a family member with dementia. That thought may conjure images of boomers caring for elderly parents, but if early-onset dementia is in play, it's a completely different equation. A spouse often becomes the round-the-clock caregiver. Rick rarely stops moving. By 6 a.m., he's up fixing breakfast for Marianne, 64, and he stays on duty until Marianne goes to bed at 10 p.m. There's no spare time to tend his vegetable garden. Rick's busy making sure his wife keeps her weight up — and colors her hair. "Are you in the hair-doing business these days?" Marianne asks Rick as he prepares to dye her hair at the couple's home outside Sacramento, Calif. "Honey, have you ever used the hair stuff?" "Me? Yeah, I did your hair in the hospital," Rick says. The reality is, Rick has played hairdresser many times. Marianne just doesn't remember. 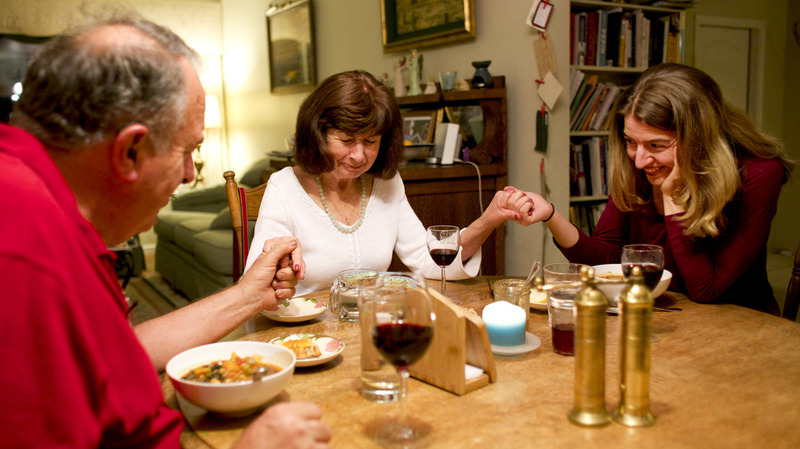 Marianne leads Rick and daughter Laurel, one of the couple's three adult children, in prayer before a meal together. He also bathes his wife, sets out her clothes and styles her hair with a straightening iron. He cooks from scratch every day. Rick's goal is to keep Marianne at home for as long as possible. He's confident he can handle the many physical demands of caregiving. It's the social isolation that's brutal for Rick. He says their social life as a couple evaporated when Marianne's dementia accelerated. "It's hard as a caregiver to know how to relate to people in a way that doesn't just turn them off. You're a broken record. The disease part of a life, the downside, it's not all that interesting, and it's not relationship-building," Rick says. "It's more just reporting the facts of a crummy situation." To help deal with the stress and loneliness of dementia care, Rick goes to a caregiver support group for men. "Your world becomes very small, and as things get worse, the friends that were helping a little bit kind of drop off. So you tend to be isolated," says Carol Kinsel, a geriatric care manager who hosts the group. It's common to find men in this role grappling with a changing sense of identity, Kinsel says, no matter what age group they fall into. "The older generation, it's really going to be a role reversal. I think the younger generation is more used to maybe participating, but it's still a big change because they have this wife who played a huge role in their marriage that's so-called fading or changing, and they're trying to pick up the pieces that she filled in the marriage," she says. Rick and Marianne wash dishes together. She no longer remembers that he is her husband. Marianne no longer recognizes that she's married to Rick, and has been for 42 years. Dementia has transformed her into someone who's dependent and vulnerable. That's triggering changes within Rick, too. He's noticed himself gravitating toward traits Marianne was known for, like empathy. "The importance of listening and caring for others. Now I can see why that is so important and why you can go through life just giving and feeling totally satisfied. You know, that's a good thing," Rick says. Marianne may no longer be the woman Rick married, but he says she's still helping him become a better husband. You can hear and read much more about Rick and Marianne Rayburn as well as other family caregivers in KXJZ Capital Public Radio's documentary series Who Cares.